Amazon announced today that Amazon shoppers can now purchase any Kindle eBook as a gift to anyone with an e-mail address. Yes, it’s kind of difficult to wrap up that eBook as a present but as a Kindle owner I can tell you this is a really nice feature addition. The Gift giver chooses a book in the Kindle Store, and sends the e-book as a gift by simply inserting the recipient’s email address. Recipients can then redeem the gift in the Kindle Store to read on any Kindle or Kindle app. Amazon adds this feature just in time for the holidays and right after earlier announcements that that magazines and newspapers will be available on Kindle apps and that users will soon be able to lend e-books for a 2-week period just like Barnes & Noble Nook readers can. If you’re wanting to get your feet wet and give SageTV a try this is your guide. I’ll take you step-by-step through the installation and basic setup of SageTV along with many screen-shots as possible. This will be a multi-part article with the first part starting with the basic installation of SageTV 7 which was just released from Beta last week. Earlier this week in Part 1 of SageTV the Getting Started Guide we covered what SageTV is, the basics of what it can do with extenders and multiple HTPCs, why choose a HTPC and the first steps of installation. The last step we covered in Part one was adding the recording directory (or directories if you have more than one) where the TV will be recorded to. I should note that I currently use two drives for recording TV. You can set your disk space usage rules as “use only, use all, leave free” along with the specified amount of Gigabytes. Notice on the first drive below I’m limiting recording space to 250GB for now, but the second drive can be filled up with recordings. Like most things with SageTV this is up to you. 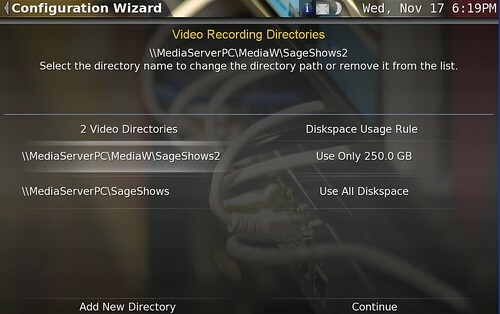 SageTV will record to both drives and by default balance between the two when possible to optimize disk read/right activity as well as available space between multiple drives. Mikinho of MissingRemote fame is hosting a meet-up in Houston, Texas for Media Center and HTPC enthusiasts. There will be presentation/talks from Cannon PC, Fluid Digital, Amulet Devices, Missing Remote’s Michael “Mikinho” Welter and more! Also part of the meet-up will be a bunch of nice demo’s including RemoteFX and other fun stuff. If you’re in the area and interested in HTPC’s this is a must-attend event. Complete details along with the RSVP link at MissingRemote.com. Newgg has a special deal on the Antec Black Fusion Remote Black Micro ATX Media Center / HTPC Case $134.95 after $35 instant discount ($2.99 shipping). The Antec Black Aluminum/Steel Fusion Remote Black Micro ATX Media Center/HTPC Case features a low profile desktop aluminum plate front bezel with LCD and IR receiver triple chamber structure and removable HDD brackets. It includes 1 external 5.25" drive bays, 2 internal 3.5" drive bays and 4 expansion slots. Want to record any channel from your Cable or Satellite TV provider? Better yet, want to be able to detect commercials on those recordings and control how you use & store those recordings? Well the Hauppauge HD-PVR is your device. The HD-PVR from Hauppauge records directly from the component out port of any device and uses the “analog hole” to bypass any restrictions put on the content by the provider. SageTV has the best (read most reliable) solution for using the HD-PVR and today I’ll show you how to install and set up the Hauppauge HD-PVR for use with SageTV’s HTPC software. HD PVR is the world’s first High Definition video recorder for making real-time H.264 compressed recordings at resolutions up to 1080i. HD-PVR records component video (YCrCb) from video game consoles and cable TV and satellite set top boxes, with a built-in IR blaster to automatically change TV channels for scheduled recordings. Audio is recorded using two channel stereo or optical audio with five channel Dolby Digital. If you’re using the HD-PVR for recording TV content to SageTV you’ll need either a Cable box or a Satellite box with a component video output and preferably an optical output for audio. Added bonus if your cable/satellite box has an active firewire port because if it does I’ll show you how to connect your cable box to your HTPC to change channels more quickly and accurately than using an IR Blaster. Hulu is out of beta (they called it Preview) and is ready for the masses. As part of the launch they’ve also dropped the price from $9.99 to 7.99 and is offering those who have been paying the higher per month subscription price a credit on their next bill. Also notable is the addition of Hulu Plus available to Roku users. • One free week trials for all new subscribers. In addition, current subscribers who joined during the preview period will receive a credit for one week of Hulu Plus toward their next month’s subscription. • Two free weeks of Hulu Plus for both current subscribers and friends they invite through our referral program. Subscribers can learn more by clicking on the “Referrals” tab on their Hulu profile page. It should be interesting to watch the coming battle between Hulu and Netflix. Something else to watch is to see what additional devices Hulu Plus crops up on in the near future. My goal in the multi-part series is to provide those curious about SageTV all of the basics they need to get started, learn more about what makes SageTV different, what SageTV can do and finally a review of SageTV 7. SageTV is a Home Theater PC (HTPC) software that performs DVR functions (recording TV, time-shifting TV), playback of movies (DVDs, Blu-rays, ripped movies on hard drive etc), music, photos and more. SageTV works with Windows, Windows Home Server, Linux and Mac (V6 only). Want to Avoid a Big, Noisy Computer in Living Room? Extenders are for You! Want a small, silent box (extender) instead of a computer in your living room? SageTV offers an excellent extender for just that purpose. But to use it as a full-fledged TV recording HTPC, you’ll need at least one computer with SageTV installed. This computer will be your HTPC server. Want to use multiple computers in the house like an extender? You can do that with SageTV. You’ll still have one HTPC server, but can then have as many additional HTPCs in the house that work just like extenders (softsled for those of you who followed MediaCenter a few years ago). These additional HTPCs will use SageTV Client. Why HTPC instead of TiVo or Cable DVR? Complete control over your content. You record it, save it as long as you like, convert it for playback on your mobile device etc. You can even stream your media to your iPad/iPod/iPhone! Commercial Skip. With a simple installation of a 3rd party commercial skip program your HTPC can detect commercials and you can skip them with a click of a button or even automatically. Expandable. Want to watch 1 show and record 5 or more at the same time? You can do it with the right number of tuners in your HTPC server. Want to save a seasons worth of your favorite shows and watch them in the summer when you have more time? It’s up to you on how big and how many hard drives you include on your HTPC. Bottom line is you can expand your HTPC as you want. Evolve as new features come along. You won’t have to wait for your cable company to come out of the stone ages – your HTPC gets new features all the time with new updates. Online streaming of content, Picasa plugins and much more is available to you with an HTPC. My favorite HTPC podcast, HTPCentric spent this month’s episode talking to Alton Marschall who recently made the switch from Windows 7 Media Center to SageTV 7. Alton gives his take on SageTV versus MediaCenter as a SageTV newbie and has some excellent criticisms of both programs. Another must-listen episode!